How To Highlight Your Instagram Stories for more than 24 Hours? Home > Android > How To Highlight Your Instagram Stories for more than 24 Hours? Instagram once followed the footsteps of Snapchat and brought Instagram Stories. But now, the Instagram Stories should not be identified as just a copy feature. It has gained immense popularity and celebrities, sportspersons and almost every user now uses Instagram Stories to create their own personal stories. Instagram Stories has now integrated a plethora of new features and a lot of customization options. Previously, you could update your story and the story was visible only for 24 hours. After that, the stories disappear from your Instagram Account leaving no trace behind. Now, the feature has been enhanced to a great extent. Even though the Stories disappear after 24 hours, but now you can save the stories to your gallery. 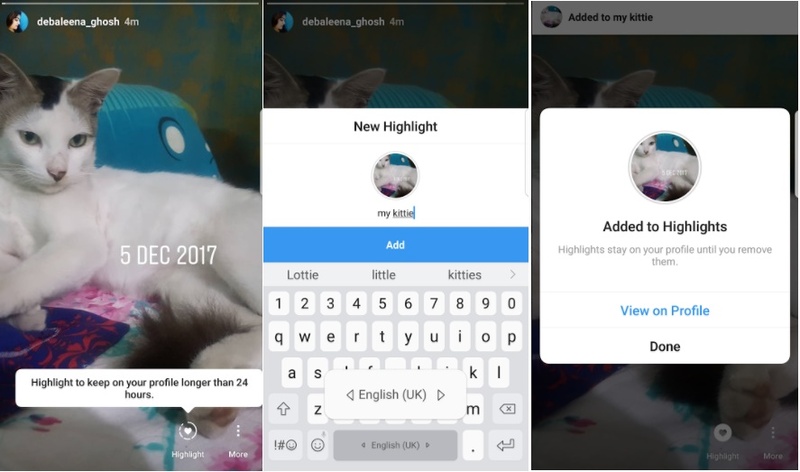 Instagram has integrated a new feature, called Highlights Instagram Stories. As mentioned earlier, Instagram Stories last for only 24 hours. But with Highlights you can increase the time for more than 24 hours. The process of doing this is very simple. All you need to do is create an Instagram Story and then highlight it. In the following steps I shall show you how to Highlight an Instagram Story to keep it longer than 24 hours. 1. Open Instagram. Go to your Profile tab located at the bottom right corner of the screen. 2. Now, click on your profile photo. 3. You will be able to add Instagram Stories. 4. Once you have created the story, open it. At the bottom you will find a Highlight option. Click on it. It will ask you to create a New highlight. Select the Highlight button and click on the New option. How To Turn Off The Activity Status “Last Seen” on Instagram for Android?